We all have our holiday traditions—the things that define each of our end-of-year festivities. For some, it's only truly the Holiday season when turkey and stuffing are on the dinner table together once more. For others, it's the smell of pine needles, or seeing the first snow, or the day that eggnog-flavored coffee becomes widely available again. Here at Wizards, nothing says "holidays" like dusting off the Holiday Cube and everyone's favorite bird-themed Sealed Queue, the Poultrygeist! If Cubes aren't for you, there's tons of Vintage support coming up this holiday season as well. 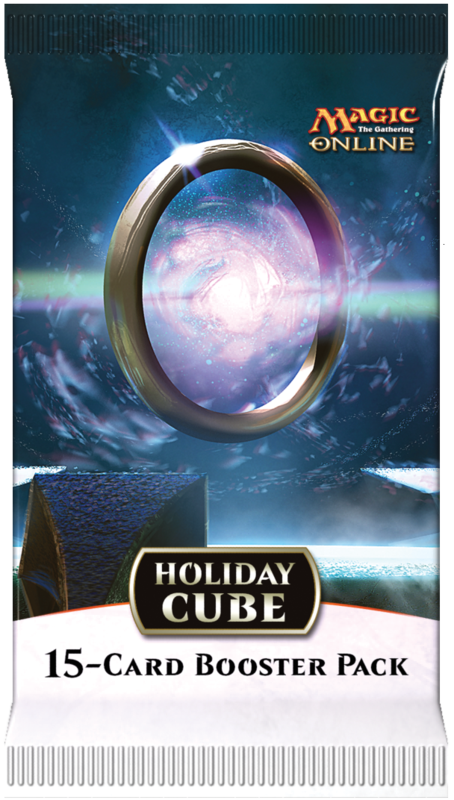 Yes, it’s the end of the year, and here at Wizards, that means it’s time to dust off the Holiday Cube once again. But this year, it means more than that! It means the Magic Online Holiday Festival—Cube, Flashbacks, Modern Masters, Vintage (and a Poultrygeist in a pear tree!) Let’s begin with Vintage events! We are excited how the Vintage community has grown on Magic Online since the release of Vintage Masters earlier this year, and we want to do our part to help it grow more during the Holiday Festival. One way we are doing this is through the Vintage Masters drafts going on now. Not only is Vintage Masters a great Draft format—it also provides a way to get some of those Vintage staples. If you'd rather watch others play, you can also see Vintage Masters drafts during the Magic World Championship on December 2, and follow more Worlds Week coverage through December 7. Update 11/13/2014: We are excited about player response to the Holiday Festival Vintage Championship. Our goal with the additional prizes of a Vintage Masters set to the top three players not playing Power Nine cards is to enable some players who are currently not Vintage players to join the community. After hearing player feedback about this implementation, we have decided to add Bazaar of Baghdad to this list. The additional prizes are now available to players who do not have any copies of Ancestral Recall, Bazaar of Baghdad, Black Lotus, Mox Emerald, Mox Jet, Mox Pearl, Mox Ruby, Mox Sapphire, Time Walk, or Timetwister in either their main decks or their sideboards. Best of luck to everyone as they try to qualify! Not enough Vintage for you? The oldest format deserves some gold treatment; we’ve decided it’s time for the return of an old Magic Online favorite: Gold queues! These 2-player Vintage queues have an entry fee of 10 event tickets, and award the match’s winner five Khans of Tarkir boosters! Looking to spend the holidays drafting? How about the previously mentioned Vintage Masters drafts, the freshly remade Legacy Cube, or maybe you'd prefer the Holiday Cube with its Power Nine cards? Missing Modern Masters? We’ll be running several Modern Masters events, plus some flashback events: Mirage block and Urza’s block! Are goofy events more your style? Last year, players had fun with Fowl Play, a Wacky Draft featuring Magic Online sets with the most birds. That Wacky Draft did kind of cheat by using Lorwyn and Morningtide's creatures with changeling. This year, we are proud to present Fowl Play 2: Poultrygeist Returns! These phantom queue events will feature the sets with the most real birds: Odyssey, Onslaught, Legions, Scourge, Eighth Edition, Vintage Masters, and Khans of Tarkir. They will close out November, running from after the downtime on November 26, through 10:00 a.m. on December 1. Have fun! Look at the schedule below for a complete list of what drafts we’ll be running when over the course of this month-long Holiday Festival. The below list will act like one of those advent calendars that award a chocolate-a-day except, instead of boring chocolate, we have delicious Magic Online events awaiting. We look forward to seeing you on Magic Online during this holiday season! START TIMES Wednesday, November 26, after downtime until Monday, December 1, 10:00 a.m. DURATION 30 minutes deck-building time. Three rounds, each round up to 50 minutes. Participation Prize: All participating players will receive a promo version of Zodiac Rooster. START TIMES Wednesday, December 10, after downtime until Wednesday, December 17, 10:00 a.m. DURATION 10 minutes deck-building time. Three rounds, each round up to 50 minutes. START TIMES Wednesday, December 10, after downtime until Tuesday, December 17, 10:00 a.m.
START TIMES Wednesday, December 10, after downtime until Monday, December 22, 10:00 a.m.
START TIMES Wednesday, December 17, after downtime until Monday, January 5, 10:00 a.m.
START TIMES Wednesday, December 17, after downtime until Monday, December 22, 12:00 p.m.
START TIMES Monday, December 22, 12:00 p.m. until Monday, January 5, 10:00 a.m.
START TIME Saturday, December 20, 9:30 a.m. Participation Prize: Top three finishers who have no special rarity (“Power 9”) cards in their main deck or sideboard also each get a regular Vintage Masters set, in addition to other prizes earned.